Dürr Vistacam intraoral camera provides marvellous images and precise diagnostics about caries. 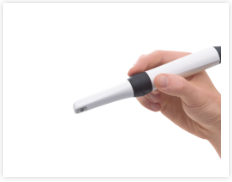 This top-quality intraoral camera does not only help detect plaque and caries but it also transmits the given data in a digitalized form, either in pictures or in video illustrations. This feature enables a more understandable communication about the future treatment between the patient and the dentist. The interchangeable head of the camera takes excellent snapshots and videos of the teeth.